Gifts are one of the wonderful ways of sending your love, appreciation, care, wishes, and greetings. With gifts, they tell their beloveds that you really remember their big days, as well as the special occasions of celebrations. On the other side, the person receiving the gift should appreciate the sender for the love and kindness. It makes the bonds stronger and let the others feel that you really liked the presents. 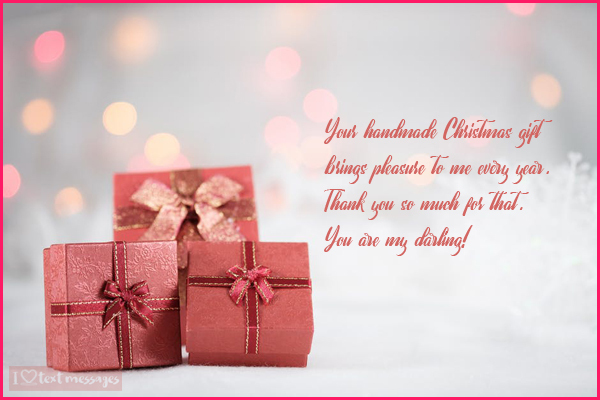 In this article, I have shared a list of 50 plus perfect thank you messages for a gift. All of them are simple, unique, heart-touching, and full of emotions. For your convenience, I have divided them into four different sub-categories. You can also change some of the words in accordance to the occasion. 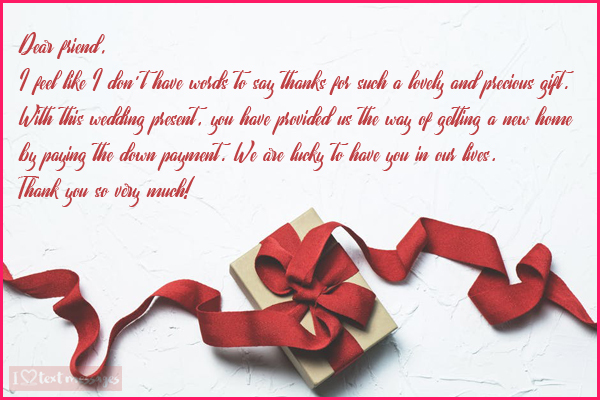 So, let’s begin now with our perfect thank you messages and tell our family and friends that their love is very important for us! Seeing you at the wedding was one of the most pleasant surprises of our special day. It was extremely good to have you on the occasion and the gift you have brought for us is just awesome. Thank you so much for your lovely wishes and the wedding present. It meant a lot to both of us! Thank you so much for your time on our special day. It was so nice to see you there. Also, we have just unpacked the gift you have presented and it has given me tears of joy and happiness. You are literally a darling friend and your gift is so much precious. Thank you once again. Love! Dear friend, I feel like I don’t have words to say thanks for such a lovely and precious gift. With this wedding present, you have provided us the way of getting a new home by paying the down payment. We are lucky to have you in our lives. Thank you so very much! Dear Aunt, you have also been one of the most loveable relationships in my life. You love is precious and the wedding gift you have given to us is just beautiful. Thank you for your love and for such a nicest gift. You are the best! It was so great to see you at our wedding. You have filled the special day with joys, happiness, memorable moments, and beautiful gifts. Thank you for your presence and the gift presents you all have given to us. Stay Blessed! My sweet friend! I know it was impossible for you to come to our wedding due to your pregnancy. But, I have received all of your love and gratitude through the gift of yours. It is so beautiful that I just can’t explain it in the words. I’m sure, every time I will use it; I will miss you! Thanks a lot, sweetheart! Dear Dad, You are the best father in the world and with this special gift; you have made me in tears. You always know that this car was my dream and I never knew that you have planned to make it my wedding gift. Thanks a lot, daddy! I will make the first visit to you in this car. Love you so much! I don’t know how you always come up with the best thing. Although your help for tying the knot with my girl and your presence at our wedding is priceless; the gift you have given is the best among all. I am lucky to have you in my life. Thank you so much for everything! Perfect is the first word that I have said after looking at the gift of yours. It is lovely, beautiful, and precious for me. And yes, also the best addition to our new home. Thank you for the love and the wedding gift! Dear Mommy, Undoubtedly you are yourself the God’s gift for me, but the wedding present you have given to me and my partner is just unbelievable. Thank you so much, my first love! We love the place! 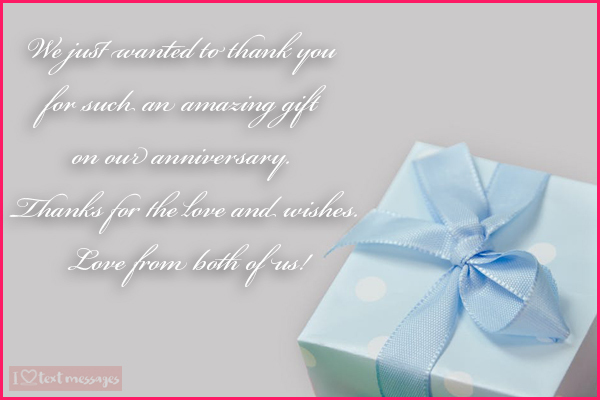 We just wanted to thank you for such an amazing gift on our anniversary. Thanks for the love and wishes. Love from both of us! Remembering the special days in such a busy schedule is only a quality of yours. And sending beautiful gifts with warm wishes and lovely prayers make you the best person in the world. Thank you so much, my dear! Receiving your gift on our anniversary has added so much joy and happiness to our day that we can never explain in the words. Thank you for being in our lives and yes, thanks a ton for the lovely gift! Receiving another mind-blowing gift on our first wedding anniversary reminds me of the gift you present at our wedding. Just like that one, it is so amazing that I have no words to say thanks to you. Still, thank you so much for such lovely gift and wonderful wishes. Today, we are feeling truly blessed for having a mutual friend like you. In these busy days, you are some of those people who have always remembered our special day. Thank you for the lovely greetings and miraculous gift. Dear Mommy! I would be happy even if you have just wished me on the anniversary and sent your warm wishes. But the gift I have received from your side has once again told me that you are the best mother in the world. Thank a lot, my mum. Miss you! Dear daughter, you are living a very busy life with your kids and husband, but your habit of remembering the birthdays and anniversaries is still the same. I and your Dad have received our anniversary gift and we are really thankful to you. I wish you would be us for the celebrations! Love you, my little girl! Bro! We have received the lovely gift in the early morning and I am feeling very delighted. You have always sent us something that makes us feel special and cared. Thank you for remembering our big day. Love you! Receiving a little wish on a special occasion fills the day with happiness. But getting a gift from a loved one is something that I am feeling right now. Thank you so much for remembering our anniversary. And yes, the gift is just awesome. Thank you once again. We wish to give you more on such a perfect anniversary gift. That’s what I was looking for many days. Thank you so much. It really meant more than everything! Thank you, thank you, thank you, and thank you for sending such lovely greetings and amazing gift. No doubt, you are a true blessing of God. Dear Husband! Today is the remembrance of our most special day. Though you are not with me because of your job the gift you have sent to me meant the whole world to me. Thanks for being the best part of my life. Thanks for sending your love and presents from miles. Love you, my sweetheart! My dear friend, I have just received your greetings and birthday gift. And you know that you have made my day special and happy. Thank you for the gift. 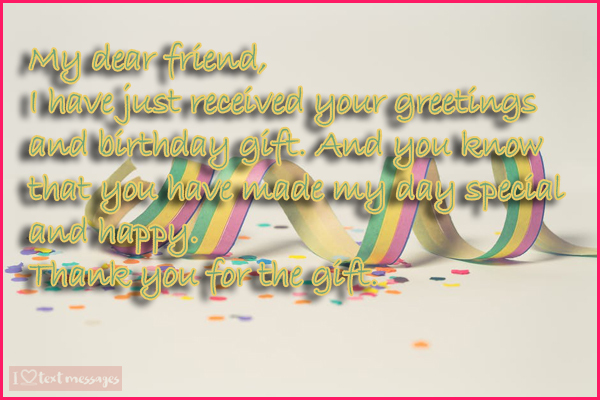 Since the time we have become friends, none of my birthdays has passed without receiving a gift from your side. Thanks for such a lovely birthday present. You are just awesome! My birthday was incomplete without your gift, but I have just received a wonderful and amazing birthday present from your side. It is a new addition to my room and it will always make me remember you. Thanks a ton! After the wonderful birthday party, right now I am sitting and have just opened the gift of yours. The first word I have said while looking at it is “WOW”. Thanks for giving me such a nice birthday present. Your love and wishes meant a lot to me! My difficult and choosy nature sometimes makes it an impossible mission for people to buy a gift for me. But, every time I receive a gift from you, I feel like you know me more than myself. Thanks a lot, a lot! Dear, sister! I have received the birthday gift and I am fallen in love with that. I must say that you know me more than anyone does. Love you and thanks a lot! This amazing homemade birthday gift is the best present I’ve received this year. It shows your love and cares about me. Thanks for being in my life and Thanks a lot for this superb gift. Holding the gift in my hands, I am just remembering the day we went shopping. I liked that necklace so much but it was not affordable. And now, the same necklace is in my hands as a birthday present from your side. I don’t have words to thank you. Still, Thanks a lot by generous and best friend. You are just great! A surprise birthday party and a lovely and amazing gift. What are you, my dear friend? How come one would be so nice, kind, caring, decent, and generous at the same time? Thank you for making my day with the birthday blast and amazing present. Every year, I wonder how do you gift me a thing, which is my all-time favorite? Well, I think this is all because of the lovely bond we have. Thank you so much, darling! You would never know how much your greetings, wishes, and gifts are important to me. A bundle of thanks for such a lovely painting. You have made it for me, which has increased its importance. Thanks a lot. I’ve hung it in my living room! Thank you so much for the surprise cake and gift. It is not actually about the presents, but the love and care one show through that. I love the way you have made me happy. Thanks once again! Seeing your gift I am thinking that you might be a mind reader. Every year I think about something to buy and before that, I got it from you as my birthday present. You are the best sister in the world. How much we fight and argue throughout the year, my birthday is always the special day when I realize your love and care for me. That’s because I always receive the best birthday present from you. Thanks a lot my elder sissy! Your choice is awesome. A gift from someone is the best way of knowing about nature and personality. And your birthday present for me is cool, decent, and just amazing! Thanks a lot. This awesome and beautiful dress is what I was looking for a year. And finally, I have got a one to wear on my last date before my wedding. I’m sure; he will love me more after seeing me wearing this! Thank you so much, my best buddy! I’m very grateful to you for the cake and the wonderful birthday present. Lucky to have you in my life! Your presence at my birthday makes no need for the gift. But for this wonderful present, I am very grateful to you. Just feeling lucky to have you in my life! I would like to say sincere thanks for such a fantastic gift. It is just perfect for me. Getting a Christmas gift from a generous friend like you is a blessing. I am thankful for remembering me on this auspicious occasion of Christmas and sending me your warm wishes. Merry Christmas, my dear! Your handmade Christmas gift brings pleasure to me every year. Thank you so much for that. You are my darling! Thank you so much for sending such a lovely and meaningful gift. It has added loads of joy to my Christmas. Thanks a ton again! And this feeling is the only thing, money can’t buy! People say gifting is an art. Looking at your gift, I have realized that you are a true artist. It is one of some those Christmas presents, which are my all-time favorite. Thank you so much! Your kind gift is a treasured keepsake for me and my family. I would like to say thanks to on behalf of all of us! Merry Christmas. The beautiful masterpiece you’ve sent has made me write to you. It is just wonderful. And I appreciate your love and care. Thank you so much, dear! Have a great Christmas day! This Christmas has brought me double happiness. One for being blessed with a cute little boy and yes, the other one is for receiving an amazing gift from you. Thanks for being my bestie. Stay blessed. Words can’t express my feelings about the wonderful and fantastic gift. I should say it took to breathe in the first look. Thank you so much for remembering me on this pleasant occasion. I will cherish it forever. Merry Christmas! I would like to express my feeling of thanks for the amazing Christmas surprise gift. I am truly grateful to you for your love and care. Thank you once again! WOW! This is the best gift I’ve ever received in my life. Thank you so much for being my friend. It is really very important for me. I wish to give you much more than a thanks message for the beautiful and stunning gift. But as for now, I am saying thank you to you and sending you my warm wishes to you! Have a wonderful Christmas. I have not met a person who is more creative than you. And your gift is its best evidence. It is so beautiful that I doubted it to be bought from a very expensive shop. But you know, the love you’ve added it has made it precious for me. Thank you so much! Thanks for always remembering me on the special occasions and sending me the gifts bring your warm wishes and greetings to me. Love! I just love the gift you have sent to me. It is the exact thing I was trying to find out since months! Thank you so much for being so nice and kind to me.